Karimunjawa is a small Indonesian archipelago located between the islands of Java and Borneo. It is situated 80 kilometers off the coast of Jepara, a city in Central Java, and is a real haven for those who want to visit somewhere slightly undiscovered, and explore isolated and deserted islands. The Karimunjawa archipelago is located in the Java Sea and consists of 27 islands – much of which constitutes a marine reserve - and only 5 of the islands are inhabited by about 10,000 people, in total. The hotels and B&Bs are concentrated on the largest of them, also called Karimunjawa, where you can find simple and budget-friendly options. From this island you can take boat trips to the surrounding areas, rent a motorcycle to visit the nearby beaches and go to the sunset point, a place that attracts tourists and locals alike. However, the best option is to stay in Menjawakan - a 22-hectare palm-filled island, surrounded by a coral reef that forms a very quiet lagoon - where the Kura Kura Resort is. A stylish seclusion awaits you on this remote island, where the comfort of a beach house meets boutique hotel atmosphere. In total, there are 35 rooms at Kura Kura of which 18 are villas of 320 m² with private pool, sun loungers, gazebo and an outdoor area with sofas, fans and plenty of bougainvillea flowers of various shades around. The other rooms consist of 2 villas of 600 m² for families and 15 small houses of 33 m². Upon your arrival you are gifted with a sarong and a purse to use during your stay and to take home as a souvenir. The lagoon surrounding the resort has a light blue shade, very fine white sand and some small fishes as well. However, for snorkeling, the best option is to take one of the means of water transport available to the visitors (stand up paddle and canoes) to the jetty that divides the lagoon and the sea; from there you can put on your snorkel gear to see the kaleidoscope of colors, that can only be truly enjoyed while underwater. 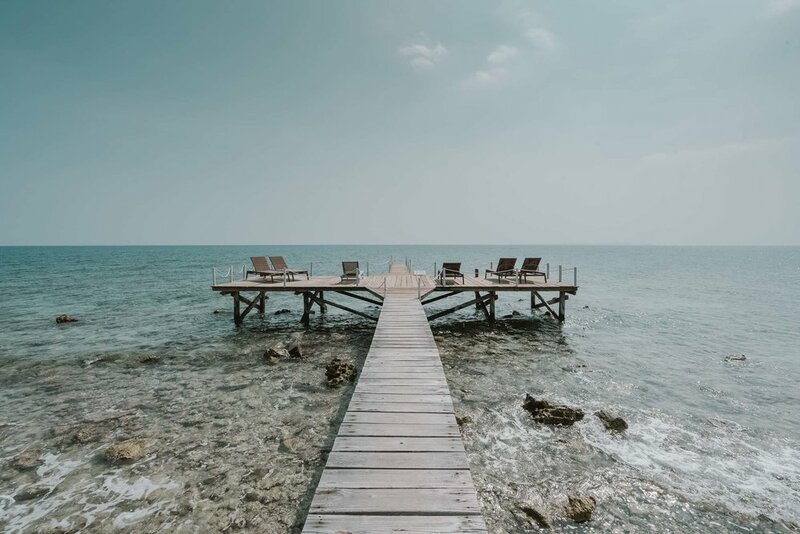 But if you want to stay on the platform just relaxing, no problem, settle in to one of the many chairs and dazzle at the waters of the Java Sea shimmering in the sun. At Kura Kura, it is very common to see sunsets which leave the sky on fire, and they are best enjoyed at the perfectly located and named Sunset Jetty - choose a drink or coconut water and admire nature’s show composed of a unique color palette, coloring the entire horizon even after the first star appears. During the show, the surrounding lagoon becomes a water mirror, reflecting all the colors of the sky, while the sun says goodbye and closes the day. From the resort you can take full or part-day excursions to visit the nearby islands, which is essential to discover empty beaches with singular rock formations and green scenery. On the excursions you can snorkel or scuba dive to admire the corals and marvel at the surreal beauty that many do not expect to find in Java. From the resort you can visit Cemara Besar - an atoll surrounded by corals and paradisiacal beaches; Menjangan and Ujung Gelam - for snorkeling and relaxation on the beach with swings, warungs (food stands, in Indonesian) and palm trees; and Fish Paradise - a place very close to Kura Kura to enjoy the sea life. The hotel management is made up of Italians (so most of the guests come from Italy) and you rarely hear another language been spoken. Not that it's easy to listen to other people – setting aside the meal times, when everybody gathers in the main restaurant – you rarely see other guests, giving you the feeling that the place is all yours. And speaking of meals, Kura Kura's package is on half board basis, and they offer a delicious Mediterranean and Asian menu. In addition to the main restaurant, the resort has another bar tucked away on the island which is open from 11 am to 4 pm; a narrow beach with soft sand and sun loungers; and a gym - which I honestly was not keen to visit. Getting to Karimunjawa is not an easy task, but the rewards of this journey are endless. The first part of the trip starts with a journey to Semarang. You can fly there from Jakarta, Bali and other domestic destinations, as well as from Singapore and Kuala Lumpur. Once in Semarang, you have two options to get to Kura Kura. The first is to take a second, 40-minute flight, that costs US$ 210, to Karimunjawa (the main island) and from there to take a boat for another 40 minutes to Kura Kura. (Alternatively, if you are staying on the main island, and not at Kura Kura, you should arrange for transportation to your accommodation.) The second option is, after arriving in Semarang, to drive to the village of Jepara, which takes about 3 hours and passes dusty and charmless roads and costs around 500,000 IDR. Once in Jepara, you then take a 2-hour ferry ride to Karimunjawa (which costs about 180,000 IDR - VIP seat and air-conditioned), and then a last 40-minute boat ride to Kura Kura (or other transfer to chosen stay). The staff at Kura Kura are happy to arrange all of your transportation needs to/from the resort, and even accompany you throughout some of the journey to ensure smooth arrival. I took both routes, choosing the first option on the way there and the second one on the way back, and although it is more expensive, I fully recommend the first one - it was amazing to see the islands with that clear blue sea and corals of different shapes down there – as it was smoother and less hassle. The best time to visit Karimunjawa is during the dry season, from April to October. In the rainy season, wind and waves make it impossible to reach the archipelago and the resort. Start using repellent as soon as you arrive, as the beauty of the island is directly proportional to the number of mosquitoes there. Always have cash. To get a sense of the prices outside of Kura Kura, in Ujung Gelam a coconut costs 15,000 IDR and a small Bintang (Indonesian beer) comes out at 30,000 IDR. I stayed 3 nights at Kura Kura, but would recommend at least 4. They provide, free of charge, snorkeling gear and water shoes to enter the water (which are a must), but nothing prevents you from taking your own. And if you're living in Indonesia and have a Kitas, be sure to take advantage of the discounts they offer.